Business Solutions (Mildands) made a successful R&D Tax Credit claim for specialist manufacturer and supplier of castings and machined parts - Boro Foundry. Based in the West Midlands, Boro Foundry has a proven reputation for the supply of quality components and service for a wide variety of industrial and commercial purchasing authorities. They are a quality, specialist manufacturer and supplier of a wide range of castings and machined parts using a variety of ferrous and non-ferrous materials. Currently, there are no certificated (Type approved) bottle top pourers on the market. The company believe that there is huge potential for this product worldwide, and have been working closely with one of their key customers, Diageo, to develop this idea further. We were approached by the company’s accountants, who thought that Boro Foundry was eligible for a claim, but wanted a second opinion from Research and Development Tax Credits experts, who had a science and engineering background. Our team met with the company’s directors and went through in detail the eligibility criteria. Following subsequent meetings, we were asked to review the company’s research and development activities within the business with a view to submitting a claim. The team were able to identify a number of projects which had significant technical uncertainty, and as such would be eligible to form a robust R&D Tax Credits Claim. A detailed technical report was produced to support the financial figures and a successful claim was submitted to HMRC. 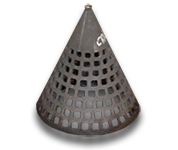 Boro’ Foundry was approached by a key client to assist in the development and manufacture of a welded filter cone for their pulverised coal delivery system. The existing part was manufactured from a rolled and formed piece of steel. This fabricated component was wearing out rapidly and required replacing every three weeks. However, with this new process, this has been improved by a factor of 10 to every thirty weeks. Boro’ realised that given the conical shape of the part, standard moulding techniques would not give the shape required by the client. It was decided to research modern 3D printing techniques and technologies in an effort to manufacture the correct shape with a new steel alloy. As a result, the engineers at Boro’ found that combining 3D CAD models with innovative Sand Print technology provided the optimum process to meet the requirements of the end user. This type of production technique has never been used in this way and in this industry before. The company believes they have developed a process which could revolutionise the manufacture of non-uniform parts for this particular industry. The development of the appropriate grade of material by composition and hear treatment being processed by novel casting means yields an enormous step change in functionality of the resultant product. Achieving significant cash benefits from 3 successful claims in excess of £50,000. Understanding that they do undertake significant research and development activities within the business. Realising that there is an ongoing tax benefit by undertaking new and innovative projects, which they may have otherwise avoided due to perceived time and cost implications. As a result of the cash benefit, being able to invest in new equipment to further enhance their in-house capabilities in order to continually grow the business.